British singer-songwriter Ella Mai, a low-key R&B powerhouse in the making, is bringing her considerable talents to town this week. 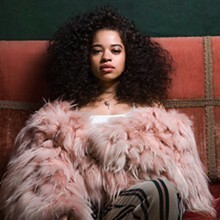 While not a household name (yet), she’s been putting in the work for several years and started to rise to prominence thanks to the popularity of her 2018 single “Boo’d Up.” The release was produced, like much of her work, by the legendary DJ Mustard and is featured on Mai’s self-titled 2018 debut LP. Prior to her official arrival, Mai released a series of three solid EPs showcasing her range as a singer, her promise as a songwriter and honing her craft until she could be as nonchalantly confident in her powers as she is today. Don’t miss this chance to catch a star on the rise.